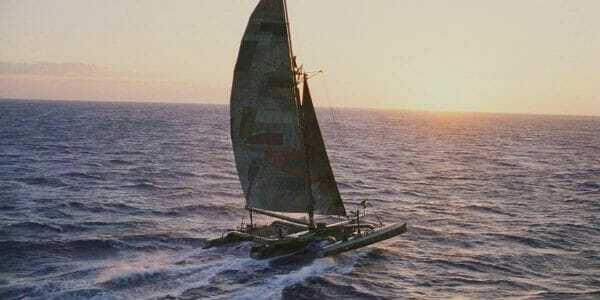 When post-apocalyptic fantasy adventure ‘Waterworld‘ first landed back in 1995 it failed to leave much lasting impression. Despite a solid cast, epic scale settings and visuals, and some nice practical action it left me wanting. Thankfully, with a newly remastered and reedited extended version (the so-called “Ulysses Cut”) now on Blu-ray we finally have a film worthy of its lofty aspirations. Something that now feels more complete. And, although, still far from perfect it puts a smile upon my face. The story’s rather simple. In the distant future, the last of the ice caps have melted leaving planet Earth entirely covered in water. An unnamed lone Mariner (Kevin Costner) sails his trimaran across the endless ocean, getting by on whatever he can salvage or trade amongst the few remaining drifters and atolls still afloat in this “Waterworld”. After a fateful encounter with a band of unholy pirate “Smokers”, The Mariner ends up with two unwelcomed stowaways–Helen (Jeanne Tripplehorn) and her young “daughter” Enola (Tina Majorino). Enola has a mysterious map(?) tattooed on her back that legend foretells shows the way to the mythical “Dryland”. And now those Smokers, led by the snarling Deacon (Dennis Weaver), are coming for the map. The Mariner and Deacon face off. Borrowing heavily from ‘The Road Warrior’ in story and structure this film diverges notably in tone. 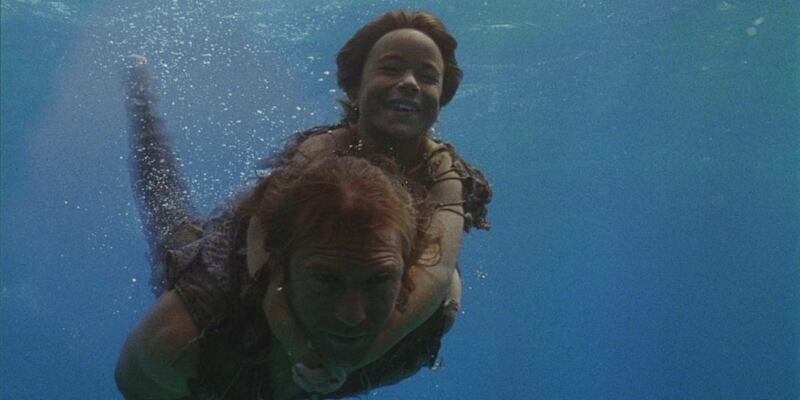 Whereas Mad Max exists in a hopeless world without whimsy, Waterworld is brimming with imagination and wonder. These people’s lives may be filled with eminent peril and looming dread, but they retain a palpable hope over a possible future on Dryland. Even the malignant Smokers only seek to improve their lot in life. The world-building is immense. 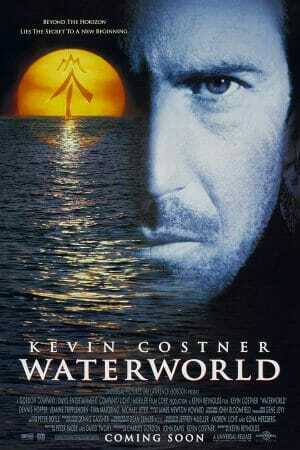 CGI was just getting its start in 1995, so director Kevin Reynolds and producer Costner shot much of the film on water. A ridiculous prospect considering the practical risks and expense constructing (and then blowing up!) these floating atolls and makeshift watercraft. Yet, while watching the beautifully remastered Blu-ray I’m left in awe of the production’s accomplishment–it looks fantastic. Ultimately, this expense is what “watered” down the impact. An exploding budget forced the studio to make judicious cuts in hopes that a shorter film would mean more potential ticket purchases. However, these cuts removed much of the film’s heart which resulted in indifference from audiences. Remember, if we don’t care about the characters, we aren’t going to care about all the spectacle that surrounds them, either. Cobbling together elements from the theatrical and extended TV edits this “Ulysses Cut” was previously only available though a thriving underground internet bootleg community. 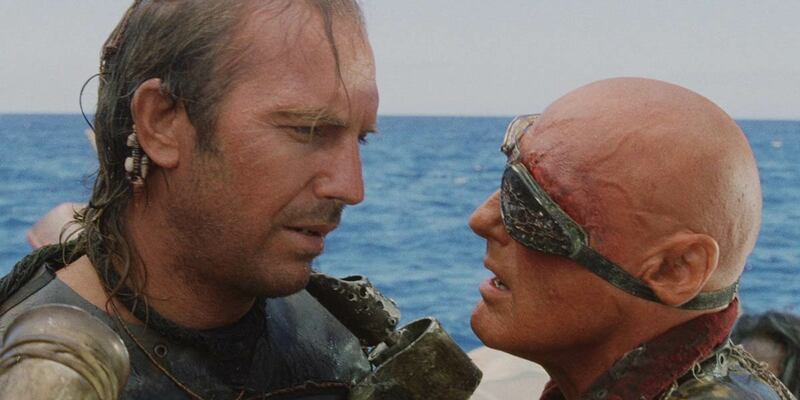 Now, after a restoration from Arrow Video–which greatly enhances all the best available audio and video footage–we get the most comprehensive version of ‘Waterworld‘. Enola (Tina Majorino) bums a ride. Helen (Jeanne Tripplehorn) doesn’t trust anyone. 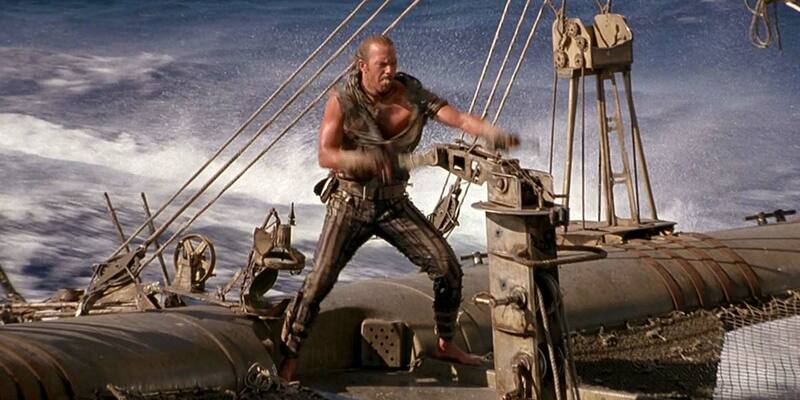 The Mariner (Kevin Costner) wasn’t made for dry land. And, although the over 40 minutes of extra footage is of uneven picture quality, the original theatrical footage is pristine–demo worthy, even. And the flow of the film is such that you’ll hardly notice. A much improved overall adventure story with often subtle morsels of added character depth. Yeah…Dennis Weaver’s one-note villain is still OTT hammy, much of the cheesy dialog and side-character quirks are cringe-worthy, and the incredulity of the entire premise and its kindergarten level of scientific understanding is laughable. However, the environmental message of “fix it or ruin it” is even more relevant today, twenty years on. As is all the crazy stunts and epic production after ‘Mad Max: Fury Road’ reminded us that CGI is meant as an enhancement–not a substitution–for great action spectacle. I even like Kevin Costner as the “whatever it takes” A-hole Mariner; his slowly developed humanity arch is earned. And kudos to Tina Majorino in playing a believably willful and intuitive child whose not annoying, nor creepily mature. ‘Waterworld‘, in any cut, is not an award-worthy masterpiece. However, this expanded vision delivers sweeping spectacle, gloriously epic action, whimsical fantasy, wondrous world-building, and heartfelt characters. It rightly deserves some respect and maybe even a little love after all this time. Beyond the silly premise and paper-thin bad guys this post-apocalypse adventure delivers remarkable settings, visuals, and action. While the extended cut improves pacing and offers some much needed depth.